This is what my garden looks like at this late date - note the fluffy mounds of wiregrass in what should be a neatly groomed blueberry patch. The benches look picturesque and "gardeny" but two are made of logs and became the home for a bee nest last summer, so I'm leery of sitting on them. The third (on the right) was built by my daughter and is solid as a rock -and heavy as one too. It'll last forever and bees don't care for it since it's treated wood. On a pole between two of the benches is a wooden garden box built by my DH and meant to be a place to stash my gloves, trowel, possibly even a cold drink hidden away from the bees. It needs to be sprayed at least twice a year - once in spring to keep spiders from nesting there, and again in mid-summer, to dash the spiders hopes again when they stop by just to check and make sure. It occurs to me I may sound phobic about insects. It's not like we don't have brown recluse spiders, black widow spiders, and many different kinds of wasps/hornets/bees that nest in the eaves/in the yucca/in the walkway/in the ground. And then there's the praying mantis (did you know they bite?). (I would never dream of hurting one of them, but I am careful when reaching into plants). I'm thinking I definitely am phobic about the insects. And I'm not even mentioning the crickets. Remember when we made comfrey and rosemary oil? It has sat and steeped for about 2 weeks, and now that I've finally located beeswax, I can make it into a salve. I've found a inexpensive little crock pot ($9.99) at Walmart to use strictly for salve making. It has 2 heat settings , and a removable liner (this saves my regular pots from terminal waxiness, nevertheless, some choose to use a double boiler instead). First things first: pour the comfrey/rosemary oil through a strainer (either wire or cheesecloth will do - anything that will remove the plant material from the oil) into the crock pot. Let the pile of darkened plant matter drain for a bit. While it's draining, let me show you what that elusive bar of beeswax looks like. I finally found it at an A.C. Moore Crafts, in the candle making section. We are using 100% beeswax (this bar costs $9.99, and will go a very long ways for salve making). To the left is a bottle of lemon essential oil. Any salve can have a scent added just by adding a drop or two to the oil mixture. Essential oils come in many fragrances, this one happens to be lemon. I never did get around to adding it to my salve (my asthma finds unscented to be agreeable). Once the oil is drained into the crock pot, throw away the plant matter, and set the crock pot on high. Stay with it - do not wander off to eat bonbons or play with the cat. Cut approximately a quarter of the bar of beeswax into tiny pieces such as the above, and add a little at a time to the hot oil, stirring as it melts. While it melts, let's look at what sort of containers are appropriate for salve. When I made my first batch, I had beautiful deep green jars. They looked perfect when I was done but I discovered it was a better idea to use smaller, shallower jars for easier accessibility. This year I've settled on these pint and 1/2 pint wide mouth Ball mason jars. I use the pint jars for dried seasonings, and the 1/2 pints for salves. Either size looks great when they're filled, and they stack perfectly too (this is an important factor with my shortage of counter space). Finally, the oil is hot enough to have melted the beeswax. Now we need to monitor the consistency of the salve so it's not too hard, or too soft, but just right. I keep a milk carton cap handy for this very reason. Take a spoonful of the hot oil mix and fill the cap. Then set it in the freezer for a few minutes to harden. Test it - if it's harder than you like your salves, add a little olive oil to the crock pot. If it's too soft, add a bit more beeswax. And here's the finished product - a soft, sage green salve filled with the healing properties of comfrey, and the antiseptic powers of rosemary. Smaller jars can be found at yard sales or GW, and if you find the beeswax on sale, stock up - it keeps indefinitely. The other supplies are all non-consumable, and should last you for years. When I pack up my crockpot, I throw a spoon, the strainer, a knife for chipping up the beeswax, and extra labels in with it. Next year, I'm ready to go. What is it about wild things this year? Why do they feel the need to crowd me? First the snake decides to play in the puppy pen and flirt with the idea of curling up on the livingroom couch, now the bees are nesting near my water garden, and the wasps built a nest over my bookroom walkway. This is not my doing! They chose to come out of the backyard and into my space! You can't see them, but directly above the solar turtle (a total waste of money but I still like him) there are 7 or 8 bees flying into that dark space under the yucca. Fine. Okay. Whatever. However, whenever I go out to pick the tomatoes to the right of the yucca, or water the herbs to the left of the yucca, or if I even just stand and watch the yucca, the nest gets upset. Lots more little bees show up, and swirl about, darting towards me. I can't have this. These are the same sort of obnoxious little twerps that stung me repeatedly last summer. Then I proceeded to the garage, flashlight in one hand, spray can (27 ft. spray) in the other hand, and managed to spray the big nest (it's approximately 7" across, and was piled high with several layers of sleeping wasps). My game plan included spraying, then pulling the steel door shut really quick. Unfortunately, it didn't occurr to me that I had the spray in one hand, the flashlight in the other, and had left my third hand in the house. Juggled can and light, grabbed door, yanked it shut, just in time to hear loud pops for divebombing wasps hitting the door. They were not happy campers. Picture me running in flip flops for the house, in the dark, waving spray can and flash light. Next morning, DH goes out early before work and decides big nest doesn't look quite dead, so he sprays it again. Whether or not he ran for his car I don't know. Later that morning, at a normal hour when I get up, I go out to check the two nests. The yucca nest is carrying as usual - spraying didn't even faze them - although when I walk by, the traffic increases, and I can almost hear them whispering "That's her -she's the one." And the big nest? The floor beneath it is littered with tons of wasps. Some are sitting up on the nest, waiting. Apparently, they were deep inside the nest, or perhaps on a sleepover at friends, and returned to a mass grave on the floor. They don't bother to whisper, they just start flying. Right into the door I slammed. Again. The war was won late last night, after a trip to Lowe's for foaming spray that shoots 25 feet. By the time I was done with it, it looked like a giant snowball hanging there. Then I sprayed under the yucca - it looked like 5" of snow had fallen. This morning, I swept up the wasp bodies. One stray wasp wandered by, and then flew away screaming, carrying tales of the giant who slaughtered an entire village. Good. This will teach them to keep their nests up under the eaves or out in the trees. Meanwhile, about the bees under the yucca? They are some tough little b$##*'s. They apparently eat bug spray for breakfast and beg for more. And for some reason, there seems to be even more now, like they are calling in reinforcements. My next gardening tool may be a flamethrower. Wait until several hours after sunset. Use the foaming stuff - the liquid just irritates them. Be ready to run (flip flops are less than satisfactory footwear). When cleaning up the bodies (or dealing with just one), don't smoosh the bodies. Wasps have a chemical in their thorax that signals their nest mates that they've been attacked. Guess what their friends do when they get that signal? Wasps have a sense of smell. They will know it's you when you come back to see how many are dead. Be prepared for this. Wait at least 24 hours before trying to remove the nest. If it's a small nest, you can leave it to discourage other wasps from nesting there. In our case, we'll be removing it tomorrow, because it's deep enough there may be eggs in there that have yet to hatch. (Yep, the fun just keeps coming). The easiest way to avoid these creatures is to wander about your home's exterior in the early spring, and use the 25 ft liquid spray to coat all the attractive spaces BEFORE the wasps start nesting. The spray lasts approximately 3 months, so just repeat mid-summer. That way they can look for more satisfactory housing. None of these suggestions work for the wasps that nest in the ground. If they are in our yard, we pour gasoline down the holes. It's simply too dangerous to chance running the mower over their nest - three people in our area have been killed over the last two summers by swarms of these guys. So - gasoline du jour it is. Tomorrow - salve making. Much less violent. Probably. I would just like to say that many years ago, I was a peace-loving, sortof flower child, mellow, anti-war kind of person. Years ago I would have carried this little bug safely out of my garden and told him to Fly, fly, fly away home! Now I get the malathion spray out. (And I kill black snakes. Apparently I am now bloodthirsty and out-of-control). But, in my defense, this little guy, Pentatomoidea, has totally invaded my space, i.e. my garden. It was bad enough when we started finding them in the house, but totally inexcusable when they left the house and discovered the garden. My garden is ruined. At least the tomatoes. Except the cherry tomatos, which are either not to their liking, or they just haven't gotten over there yet. Probably scheduled for next week. Can't be everywhere at once you know. So yesterday, I did what I usually do ('cause I really don't like mixing poison, or things that are flammable, but that's another post). I called my dad. He knew exactly which poison to use, and came right over to mix up a batch and spray the tomatoes, and the peppers and gourds just so the stinkbugs would have to find another place to dine. If there's any left alive that is. 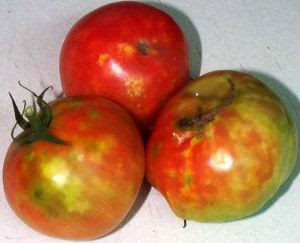 Hopefully, the green tomatoes will now survive and at least a partial crop will be possible. It is footloose and fancy-free, multiplying, dividing, and invading homes, gardens, and running will-nilly wherever it wants, while snacking indiscriminately on my tomatoes. 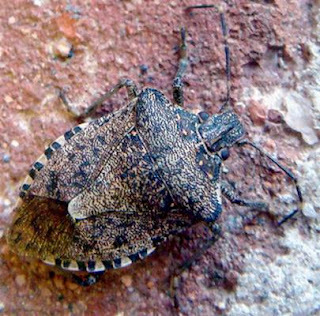 The worst feature of the stinkbug is it's smell - designed to attract other stinkbugs, it's apparently gross and vile to humans. I say apparently because I can't smell it. Nada, zip, nothing -could be roses for all I can tell. But with the whole inconsiderate attack on the tomatos - the gloves came off and the poison went on. I could hear screams from the battlefield all night. Tomorrow, I go out to survey the carnage, and take back my tomatoes. And I'm not at all sorry. This is my beautiful comfrey plant. Actually this photo is a couple weeks old, and it's rained (a lot) since then, so now it's much bigger. And it's an herb, and now I have to figure out what to do with it. Especially since it's a perennial, and will be back next year, probably laughing at me, if I can't figure out what it's good for. So - besides having huge broad leaves, with fuzzy fibers all over them, loving full sun and lots of water - what else do I know about it? It has beautiful, fairy-like tiny purple flowers. It grows as a wild-flower in Britain, with a long history of medicinal use. It is the herb formerly known as knitbone, and modern research has confirmed that it contains allantoin, which speeds up cell replacement and helps with bone injuries and ailments. 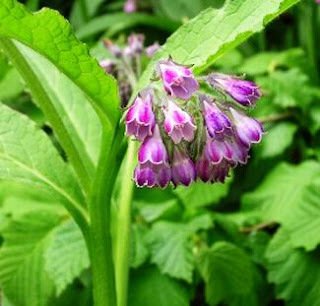 Comfrey has been used to treat everything from lung disorders (asthma, bronchitus), to broken bones and sprains, to arthritis and ulcers, as well as burns and acne. Internal use (teas and such) is no longer recommended -although I know many who use it for that, but I don't, being the one who prefers to err on the side of caution. But comfrey salve is wonderful and making your own is easy. (Look for a post shortly on making salve). It can be used on sore muscles, bruises, burns, rashes, etc. 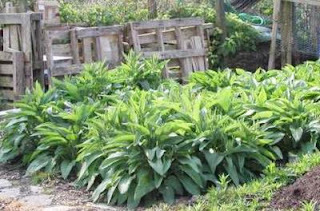 This is what a proper comfrey bed looks, much bigger than my medium-size potted comfrey.The plants can be propagated simply by dividing the clumps (much like daylilies or irises). It spreads easily and is hard to get rid of (like horseradish). 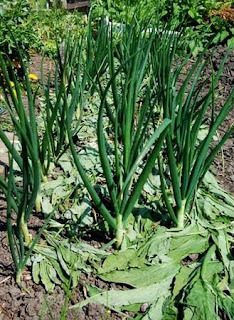 But if you have one of those proper beds of comfrey, the cut leaves make a great mulch for plants that like a lot of potassium (flowers, fruit or nut-bearing plants, also onions, gooseberries, currants, roses, potatos, tomatos). The leaves break down into a thick black sludge, and a few added to your compost heap will produce heat, and help the rest of the compost plants decompose. Or, if you have rain barrels, several comfrey leaves can be added, producing a manure tea after 4-5 weeks. Such a sweet little plant in a pot, but capable of so many uses. Look for the comfrey salve post in the next couple days.